Hello Everybody! 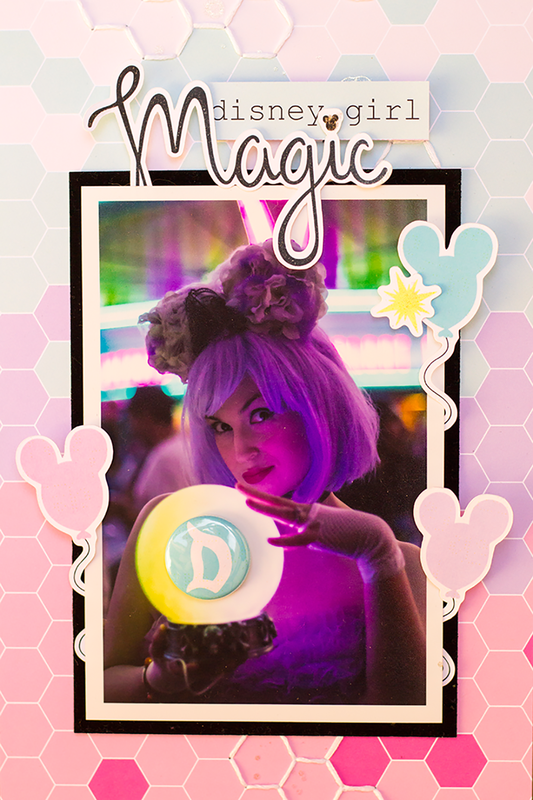 Today I'm sharing a recent layout using the dreamy Wonderful World of Disney Kit!! This layout actually goes in my October Daily for 2017. It's from the event Andrea hosted last October at Disneyland where she dressed up as Madame Leota! I feel so lucky to have been able to attend one of her events. She goes all out, and the walk around the park after where she gives memory keeping and photo tips (as well as her husband taking professional photos) is awesome!! I happened to snap this pic of her with her face lit up by her crystal ball, and it's one of my favorites! When I put this layout together I chose the photo and background paper first. The photo is so dark I knew I wanted to add in a strip of black at the top. So I went through my stash and found an old black velvet textured paper by Doodlebug. I liked it so much that I ended up placing a thin border of it around the photo as well. The photo itself is slightly popped up with a thin layer of white foam paper sandwiched between it and the black velvet. This made it easy to tuck the die cuts between the two once I decided on which to add. Next, I decided on the upper case D flair centered in the crystal ball. I super love how that looks! At this point I decided to add white embroidery thread around a handful of the hexagons before it became too difficult to tuck the ends of the thread under more elements. I really like the texture the embroidery adds. Then, I popped up the die cut word "Magic" and word strip "disney girl", layering them together as my title. To add just a little something extra I used my Wink of Stella to add glitter to the "Magic". I also, splattered just a little on the background for balance. I could have stopped there, but when I saw these cute Mickey head balloons, I decided to tuck them around the photo in between the photo and black velvet paper. To attach them I used a foam circle just in the center of the Mickey head. To mimic the crystal ball and blue flair, I also added the yellow burst die cut popped up to the left side of the blue balloon.....and that's it for my layout! I have jounaling to go along with this page planned for the opposite side in my October Daily, otherwise I would have also added in the date and a description.